I know it may be a little bit late to post my August favorite but since I took a break last week I will be posting my favorites this week. I only had a few favorite things in August so these posts won't be too long. 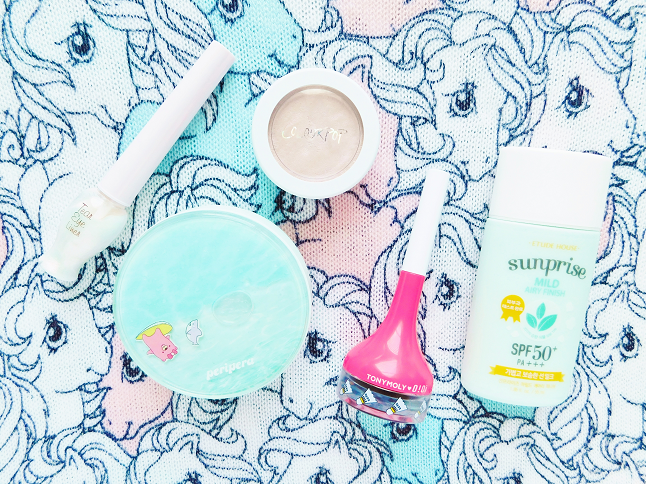 This month I only had 5 beauty products that made it to my August favorites. Let's start! As much as I adore my trusty Missha Sun Essence I want to try out other sunscreens. 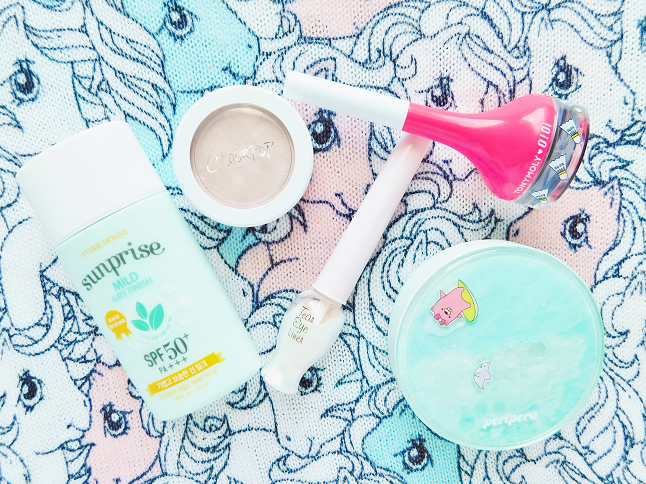 The one I decided to try in August was the Etude House Sunprise Milk Airy Finish Sun Milk. Etude House has a couple different sun protection formulas but I decided to go with a sun milk because I never tried one and wanted to see how the formula compared to other sunscreens. It sets to a powdery finish so if you are not into dewy sun creams you want to consider checking this out. 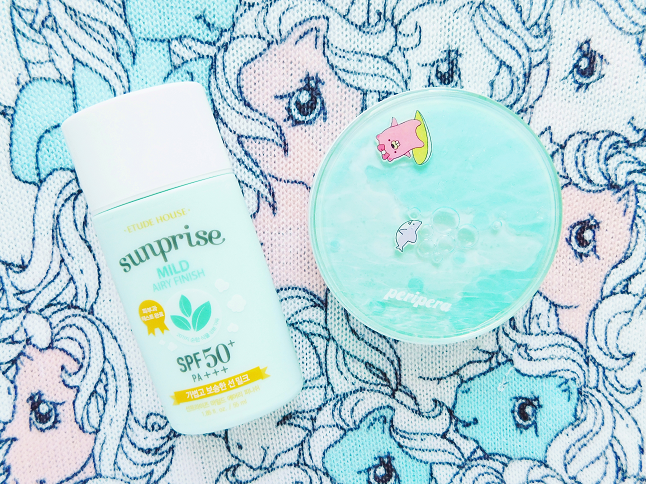 Every summer I try out a new cushion and this year I decided to try the Peripera Ink Lasting Mint Cushion. First off, the packaging just screams summer! I love the natural coverage, the mint controls redness and lasts a pretty decent time. You can read my full review here. One of my favorite eye liners! When I saw that it came in a cute packaging I jumped at the opportunity to buy it. Once I finish the line I plan on reusing the top part and just buying the eyeliner so that I can keep using the cute packaging. When it comes to my makeup I don't really contour or highlight often (it's just not my style to wear too much makeup). However, recently I've been getting more into highlighting. I own a couple highlighters but Monster is the one I've been gravitating to the most. 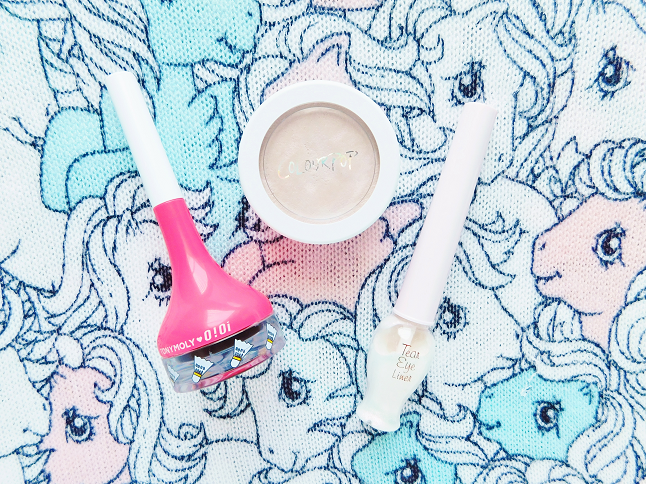 It's a duo chrome highlighter that looks lovely when struck by light. This is my second Tear Drop Liner by Etude House but this time I decided to get a different color. The shade is a beautiful light pink (almost duo chrome) glittery color. The only problem with Etude House Tear Drop Liners is that they don't last long. If anybody knows of a glittery liner that lasts long and possibly water-proof please let me know.